Spring has arrived. With the warmer weather, now is a good time to check your home for any damage it might have sustained during the winter. 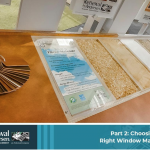 Once you’ve shortlisted your window design choices, it’s time to consider materials. Window material will matter in almost every aspect of a window replacement project, from product and labor costs to window maintenance and longevity. Needless to say, you have to choose the right window materials to ensure that your investment proves worth it.